Parking is one of those things everyone in Berkeley complains about (ironic for a city that is supposedly environmental). Merchants especially have complained about parking “deficits” in downtown and southside areas. And yet whenever city planners measured parking occupancy, they found empty spaces even during peak hours. What was going on here — was there or was there not a parking crunch? As it turns out, both sides were right. Due to inefficient pricing, the prime on-street spaces were monopolized while garages and other areas went under-utilized. 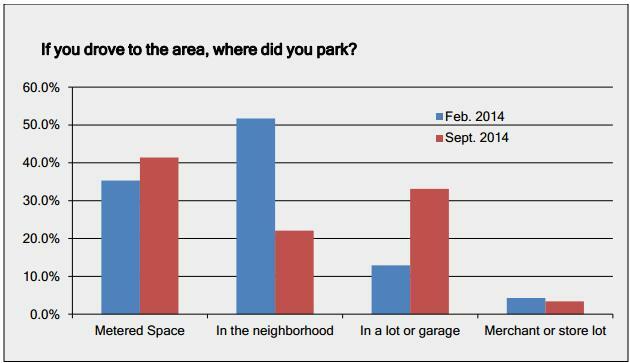 Drivers would typically drive in circles hunting for the cheap on-street parking, avoiding more expensive garages. Could market-pricing strategies correct the parking imbalance, and result in more efficient utilization? The city received a 3-year Federal grant to test that hypothesis. The transportation department analyzed parking occupancy rates in three neighborhoods, continually adjusting parking hours and pricing based on demand. Price and time limits were set with a goal of always having 65-85% occupancy on each block. Where parking exceeded the 85% threshold, prices went up and time limits went down. 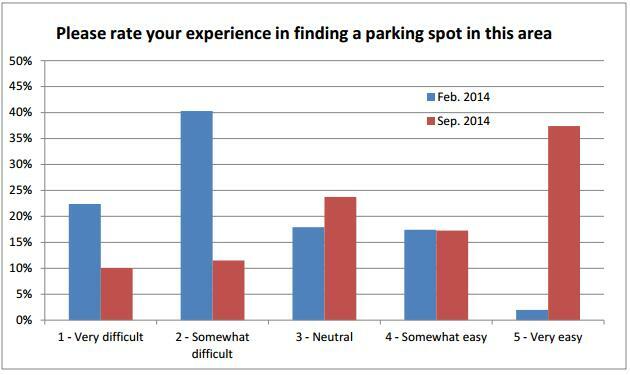 Where parking occupancy dropped below the 65%, prices were reduced and time limits increased. Clear signage was installed to inform drivers their pricing options. But the most surprising result is the large number of blocks where price and time limits were relaxed due to minimal parking demand (remember: price and time limits can go up or down depending on parking demand). On the map shown below, these are are indicated in green; i.e. 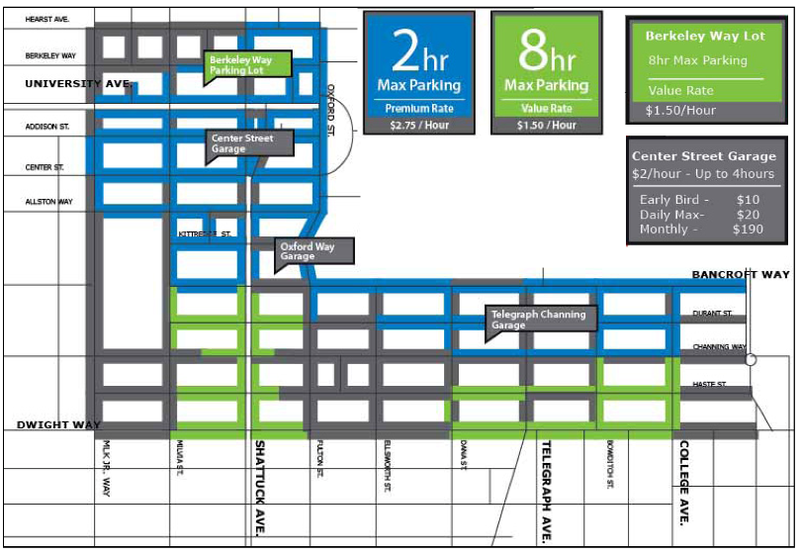 the Max Parking Zones. It is interesting that areas that were thought to have very high demand, such as 2 blocks from campus, actually don’t have very high demand at all. The program is on-going. One of the next challenges will be automating the collection of real-time data. It is currently done manually, which doesn’t scale well. The city is exploring technological solutions to automate the process, such as the use of parking sensors or license plate readers. I think one of the pieces missing in all of these discussions over parking pricing reform is the acceptance of the status quo of the quantity of supply. That is, we’re searching for the “market price” GIVEN what has already been built. It doesn’t seem like anybody has thought about what it means in terms of land use modification. I suppose at that point it just becomes a value judgment (we know parking costs x amount, if we build y parklets and tear down this parking garage to build housing, parking in the city will then likely cost z), and nobody wants to make that decision. Also, there was an article a couple of weeks ago in Berkeleyside saying that goBerkeley was ending as a pilot. I suppose they’re looking for more funding. You’re right about land use and the status quo bias in a lot of these discussions. But I think this dynamic parking pricing is a huge step forward on those issues. In most places there is a similar perception that there isn’t enough parking and this always drives planners to allow or force more. Dynamic pricing allows us to see how much there really is and what it is worth to people. It doesn’t answer the question of “how much parking should there be.” But it’s much easier to answer that question when you know how parking is used and what it costs. Yes, 100% agree. This is probably the next question to ask, once we get a better view of the market price. This just goes to show how hyperlocal the parking market can be: when spaces are underpriced or mispriced, everyone is circling around the same block trying to get those same 10 spaces right in front of the popular store, while there are plenty of empty spaces a couple blocks away. With street parking pricing, there’s a strong signal that some spaces are in strong demand, and if you don’t want to compete with others for those valuable spaces you know where to go (the streets with cheap spaces). Even without changing the prices and hours, just informing people of where parking is available would be a big change. A lot of people circle the block because they don’t know if the next street over is no-parking. Too bad you can’t go back and re-do the experiment with JUST the clear signage and compare to clear signage + price adjustments. Thank you for your comments about the parking supply issue, which Berkeley did not address, but in a way will. My above blog on the point touches on this as it relates to new bikeways. But Berkeley’s downtown will soon be losing some surface parking lots, which this GoBerkeley Pilot should help deal with but then a new downtown parking garage will be built, contrary to what this study suggests is needed. But also, as I say in my blog, on-street parking will need to be removed in spots in Berkeley to build out a complete bikeway network, and the GoBerkeley pilot will help us then, as we work to make Berkeley’s downtown truly bike-friendly. Downtown Los Angeles recently started an experiment with this, they also found numerous blocks where pricing fell under the algorithm. Drivers really want to crowd into the most centrally located spaces, creating the appearance of a parking shortage. Reducing surface parking in the cities is definitely a good idea. What pricing can contribute in cities like Berkeley is demonstrating that there’s not in fact a terrible parking shortage.